Admins are users in your Zinc organization who have access to the administrative console. There are three Administrative tiers in Zinc, each of which has a different range of access and privileges in your organization. Organization Admin: This is the top tier administrator. Organization Admins can control all aspects of the organization, with abilities including: adding and removing users; creating and managing folders and official groups; sending and managing broadcasts, managing broadcast lists, adding notification bots, managing other administrators, and viewing an entire organization’s analytics. 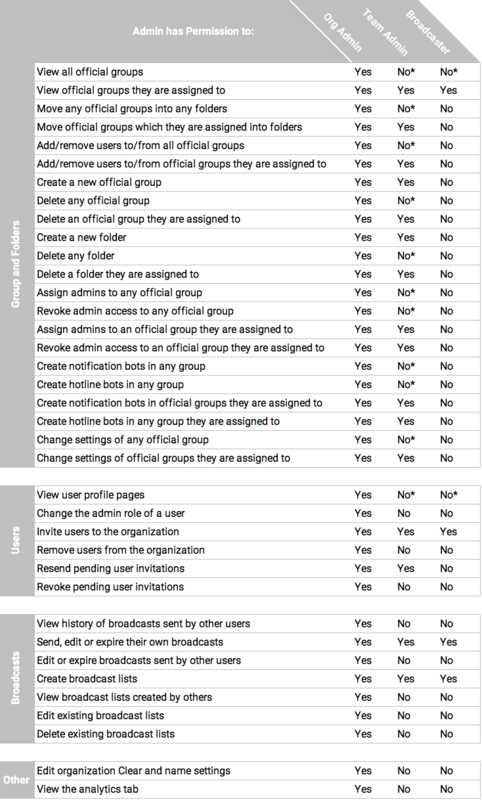 Team Admin: The next tier, the Team Administrator, has admin access to the specific groups, folders, and broadcasts to which they are assigned or or which they have created within an organization. A Team Admin will not be able to manage other Team or Organization Admins’ groups and folders without first being granted access. Broadcaster: Broadcasters have very limited administrative access and can only manage and send broadcasts that they create. Note: In the Admins tab of the Admin Console, Organization Admins can promote non-Admin users to Admins and change the Admin tiers of all admins in their org. Refer to the matrix below to determine if a particular type of admin will be able to take any given action within your organization. * Broadcasters and Team Admins can perform this action if they are granted the additional All Organization Access permission. Learn more here.